Good Energy was founded in 1999 with a simple mission: to transform the way the UK gets its energy in the fight against climate change. At the time, the UK only got 2% of its power from renewables, today that figure stands at 24%. There’s quite a way to go but Good Energy is making it easier for us to get there, investing in and supplying the UK with solar, wind, tidal and biomass solutions. But it’s not just about the kind of energy it uses, it’s also about where this comes from. Importing energy from abroad is expensive and only increases the carbon footprint of the industry: internationally imported fuel has an average journey of 2,500 miles, but Good Energy’s average distance from generator to household is 3.86 miles. Generating so much from the UK means we can reduce the energy involved in transportation whilst becoming become more self-sufficient and less prone to unexpected price rises. If you haven’t gotten wind of renewable energy yet, Good Energy is a great place to start turning the tide! How do I use my Good Energy voucher? 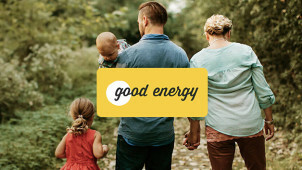 Sign up to Good Energy’s mailing list to hear about some brilliant offers! Does Good Energy have advice for helping me save on my energy bills? Yes, check out some great tips here. Will I get a smart meter if I switch to Good Energy? Yes, you will receive one by 2020. Does Good Energy provide a meter reading service? You can submit your own readings or opt to have yours read. You can cancel your contract within 14 days from the period you signed up. It’s not always easy to do your bit for the environment, but you can make a huge difference to your carbon footprint with ease by switching to Good Energy. It’s a 100% sustainable energy provider that generates all its own power, rather than importing fossil fuels from abroad. A Good Energy voucher could save you money off your new tariff, so you could make your power green and your bills lean when you switch today! Good Energy gets its power from nature in a variety of different ways. 24% of its stock comes from solar power, 53% from wind farms, 4% from hydro-electric dams and 19% from biomass. And it keeps pushing the envelope too, 6% of its green gas comes from biomethane, gas produced from organic matter such as manure and sewage. Good Energy continuously invests in new wind farms, tidal lagoons and other projects to ensure the green energy keeps on coming! Good Energy makes it really easy to switch: just enter your postcode and details to get your quote, then get in touch and Good Energy will get things moving! There are no pages of complicated options to read through: just choose from an electricity-only or duel-fuel tariff. A Good Energy discount could save you money on your quote, so it could be good for your budget as well as the environment.